According to a Forbes survey, Paris is the best city in the world in terms of eating well, ahead of Rome and Tokyo. I lived in Paris between 2005 and 2008, for 3 years, on the right bank in the 8th arrondissement. Naturally, my list of favorites reflects that to a certain extent, although the Paris Metro takes you very efficiently anywhere in Paris within the Paris beltway. The list is a mixture of own experiences, recommendations by others and finds in the internet that I still have to check out. In the following list of Schiller's favorites, I distinguish between restaurants, brasseries, bistros, cafes and winebars. Restaurants are open only for lunch and/or dinner. You go there to eat, often in a rather formal setting. For dinner, the restaurants in Paris typically open at 8pm. The best restaurants are those with 1 to 3 Michelin stars. Bistros are scaled down versions of restaurants, also open only for lunch and/or dinner. They tend to be less formal. Some bistros are Michelin-starred. Brasseries open very early in the day and serve breakfast, lunch and dinner. You can also have just a beer or a café. My “down the road” brasserie Paris Europe would open at 6:30am and I often would have a croissant and an espresso there before going to work. Wine bars primarily serve wine by the glass, but most of them also have elements of a bistro or a brasserie. Accordingly, I have listed, for example, Willi’s Wine Bar – a popular hang-out for Americans and other expatriates in Paris – as a bistro. Cafés serve as places where people sit to have a café, by themselves or with others, eat something or have glass of wine. Most cafés serve lunch and light dinners in the evening. They generally do not have pastries except during mornings, where a croissant or pain au chocolat can be purchased with breakfast coffee. Historic place with outstanding food. The oldest continually operating restaurant in Paris. Tucked like a jewel box in the Palais Royal’s quietest corner. Famed for what is probably the most sumptuous wine cellar in Paris. Legend. The romance of days when men like Henry James and Ernest Hemingway gathered here is still very much alive at this popular café-restaurant. Nice outdoor dining. Owned and run by the Brit Mark Williamson, well known in the American community. My favorite couscous place in Paris. No reservations. Prepare to prop the bar (and be rather more intimate with your neighbors when you sit at your table). Setting under the arcades of the picture perfect place des Vosges. The Passage des Panoramas (off boulevard Montmartre) is a beautiful belle époque shopping arcade. Tucked away inside is Les Racines, owned and run by Sommelier Pierre Jancou, who is evangelical about vins naturels. Version 2, featuring the same product-driven cooking as the original, in a Philippe Starck-designed space. Owned by the legendary Tim Johnston - and recently handed over to his daughter Margaux - the wines are very interesting as is the Anglophone clientele. Tiny place focusing on “natural wines”. Has gained cult status among natural wine drinkers. Has a new owner and we will have to wait and see how things develop there. Enrico Bernardo, youngest-ever winner of the World's Best Sommelier award, runs this restaurant where, for once, food plays second fiddle to wine. You are presented with nothing more than a wine list. Each of 15 wines by the glass is matched with a surprise dish, or the chef can build a meal around the bottle of your choice. Strong Italian influence. Excellent bistro, tucked away in a side street near Place de Clichy. Not in any guide. Resembles an ancient bistro, but in reality, this used to be an internet shop that American restaurateur Kevin Black converted into a bar à vins. He is a self-trained chef and passionate fan of natural wines. My favorite place for a pot (a drink) after work. A legendary temple of jazz music, Le Bœuf sur le Toit has successfully combined elegance and modernity while preserving its Art Deco soul. Come taste the latest trends in our original, typically Right Bank food, just a stone's throw from the Champs Élysées. My “down the road” brasserie, just next to my apartment building: Cette belle brasserie traditionnelle propose plats du jour, desserts frais faits maison et accoudé à son imposant comptoir on y déguste volontiers ses sandwiches et salades qu'accompagnent avec bonheur d'honnêtes vins de pays. Le Café PARIS EUROPE vous reçoit du Lundi au Samedi de 6h30 à 22h30 et vous offre son service continu dès 11h. One of the remaining 19th century workers’ canteen in Paris that has kept not only its mirrored interior, but also its low budget menu. Was classified as Monument historique in 1989. An interesting place for people who live on a tight budget and are happy with very basic quality. No reservations - expect to wait in line. Located right in the heart of Paris, a stone’s throw from the Grands Boulevards and theatres, Brasserie Julien is a listed historical monument. With its Art Nouveau style, its grand mouldings, its immense mirrors and its “Flower Ladies” painted on pâte de verre, Julien offers you an exceptional setting and cuisine which is every bit as refined. One of the most beatiful brasseries in Paris, but has become a favorite of Japanese tourists. My recommendation: Take a drink in the lounge. An institution. Huge. Josephine Baker took a bath in the fountain, which sits in the middle of the brasserie. My absolute favorite. No reservations – you wait at the bar. One of my favorite neighborhood brasserie, when I used to live in Paris, “c’est correct” as my French friends used to say – not more and not less. A Marais institution. Annette's favorite. Small place with a horse-shoe bar and seats outside. The haunt of the Surrealists in the 1920s and 1930s. Picassos met muse and model Dora Maar here. Simon de Beauvoir and Jean Paul Sartre kind of lived here. I sat several times next to Karl Lagerfeld (in the late evening). Another Paris literary haunt legend, but I prefer Café de Flore. Lenin and Trotsky sipped their café crème here in 1915 and made it famous. Jon Rowley likes it. The Paris Kitchen: Raquel Carina and Philippe (Pinouche) Pinoteau’s retro Le Baratin is a special little place in Belleville – cherished by the food & wine industry who come for “mama’s” fantastic home cooking & to talk natural wine with Pinouche.Its longstanding success is interesting. It isn’t in central Paris, it isn’t on the hot list, and visitors often wonder what the fuss is all about after having eaten there. restaurant et bar a vin - Lavinia is one of the biggest wine shops in Paris, with a broad and deep selection of French wines, but also some New World wines. Upstairs there is a restaurant and a bar where you can drop in for a glass or a bottle of wine at the wine bar, until 8 pm. At the wine bar, you can choose any of the more than 5000 bottles they sell at the shop and just pay the shop price. Paris by Mouth: A place to eat classic French bistro food (oeufs mayo, steak frites, celery remoulade), drink from an excellent wine list, and be surrounded (still, for now) by actual French people. Willi Igel: Und natürlich (kann ich) den Griffonier beim Elysee um die Ecke (empfehlen). Der hat vom offenen Beaujolais aus gutem Hause bis zum Romanee Conti von Romanee Conti alles. A stone through away from the Grand Vevour, in the corner. Opened in 1905, a solid down-to-earth wine bar. Paris Bouge: Installé au cœur du plus vieux marché de Paris, le marché des Enfants Rouges, Versant Vins est une « cave à manger ». On y trouve une cave à vin alternative entièrement consacrée aux vins atypiques, naturels et biologiques, sans additifs chimiques. Le gros plus : ces vins naturels ne contiennent pas de souffre et ne donnent donc pas mal à la tête ! Pour accompagner la cave du Versant Vins, Jeanne, la caviste et dégustatrice, vous propose le Versant Faim pour accompagner au mieux les vins. TimeOut: In this tiny den devoted to the glory of wine, the walls are carpeted with bottles and barrels are stacked from floor to ceiling. If you arrive a little late for after-work drinks, there’s no hope of getting even half an elbow on the bar – you’ll be out on the pavement along with pretty much everybody else. Those locals in the know bring their empty bottles here to fill them direct – and more cheaply – from the barrels. There’s also a good selection of bottles available to take away. Joyce From Paris: ... mein absolut favorit, weil "à la bonne franquette": Le Baron Rouge. Da muss du hingehen wann der Marché d´Aligre sonntag morgens statt findet, es stehen riesen Fäßer draussen und es werden Austern verkauft mit Wein. Ein sehr sehr Parisianisches Erlebnis und wenn du Austern nicht magst es gibt Planches de Fromage et de Charcuterie für 10€. Joyce From Paris: Dann empfehle ich dir auch Les Rouquins, sehr sympatisch und gute Weinauswahl von kleinen Winzer. Le Figaro: Cette cave à manger propose une large gamme de fromages, charcuteries et autres mises en bouche, que l'on accompagne d'excellents crus. 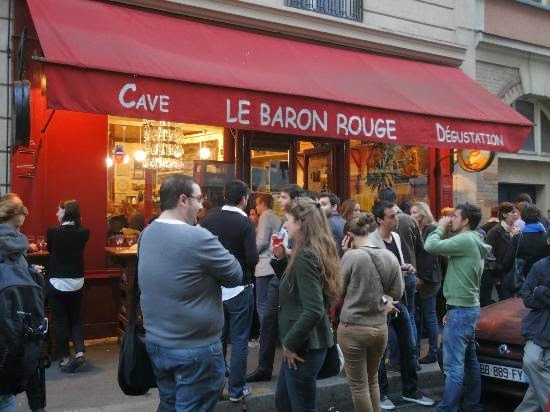 Paris by Mouth: Crêpes up front and pork (Ibaïona) in the rear. It’s standing room only at Yves Camdeborde’s tapas and wine bar, a hit since it opened in fall of 2009. Go during the off hours or be prepared to be get to know the person next to you very, very well. A wine store, which closes in the evening. But during the day (until 7pm), at the horseshoe bar, at one of the tables, or in the covered galerie, numerous wines are available by the glass. Was just sold to an Asian investor. When I lived in Paris my “down the road bar” was Le Petit Monceau, just next to my apartment building in the 8th district. There are hundreds of these wine bars in Paris. This is the place where people from the neighborhood meet after work “pour un pot”. You would stand at the bar, talk about Carla Bruni and other gossips and have a decent French table wine. Typically, only French wines are on the wine list, but not the expensive ones, only the reasonably prices ones. Many of the wines at the Le Petit Monceau are from the South of France. The food is simple, nothing special, but good. I would stand at the bar from 7 pm to 9 pm and then move on to one of the tables and have some food. Le Petit Monceau in the rue de Monceau was run and owned by a guy by the name Richard, my friend , when I was there, but has changed ownership and management since then. Britt Karlson: It looks like a wine store and it is a wine store. But also a very inspiring place for a lunch or a dinner, amongst wine bottles and wine cases. The selection of wines is amazingly good, if you – like us – like small, ambitious producers with a penchant for terroir and organic viticulture. For lunch there is a small menu, you can choose between two or three courses (entrée and main course is 13,90 euro). Nothing fancy or complicated, but very good and well prepared. For dinner there are mostly charcuteries and cheeses but also foie gras and various patés and terrines. And desserts. Very nice atmosphere and service. Booking recommended for dinner. The newest bottle shop on the block from the boys behind Septime. Shop to go, or stay and pop your cork with a €7 droit de bouchon. Snack options, for those lucky enough to snag a stool or a piece of counter, include pancetta di Colonnata, house-smoked duck breast, anchovies with ricotta, foie gras with smoked eel, with prices ranging from €4-14. This isn’t a restaurant, a place for large groups, or a substitute for Septime, but it promises to be a perfect spot for a high-quality/low-key apéro. Dead cheap glasses from €3-5. GuideParisMode: A la fois caviste, vente à emporter (fromages, charcuteries, de délicieux sandwichs du jour), un bar à vin avec autour du comptoir quelques tables pour une petite restauration et dans l'autre salle une épicerie fine (miel, huiles, terrines...) avec une belle sélection de vins natures et bios. An institution for organic wines. Paris by Mouth: With its zinc bar, hearty home cooking, and colorful local clientele, this beloved wine bar (and its Turkish toilet) seems impervious to change. Meals are served only at lunch; the rest of the day you can stop for a glass of Morgon or Brouilly and a snack. About travel: O Chateau, a new wine bar in Paris, is the latest venture of a company by the same name that has long run very popular and light-hearted wine tastings throughout the city, as well as champagne cruises on the Seine. It especially caters to English speakers, says owner Olivier Magny, who estimates that a good half of his clientele are Americans. O Chateau: When we decided to create a wine bar in Paris, our idea was simple. We thought to ourselves: let’s create the place where we’d love to hang out. A wine bar with a great selection of wines by the glass, terrific food, beautiful decor, great music and friendly (and bilingual) staff. That was our idea. Since then, O Chateau has been adopted by Parisians and worldwide visitors alike as a landmark in Paris for wine drinkers.Before 7PM, you can show up without a reservation, no problem. Now, if you intend to spend the evening with us, it’s always best to make a reservation. You may do this over the phone (our number: +33 (0)1 44 73 97 80) or online. All the restaurants listed below serve French cuisine, except otherwise specified. Restaurants in each category are listed by postcodes (i.e. by arrondissements). Stars in brackets denote recently lost stars. Thank you for this post and for all these tips. I would just like specify something concerning our opening hours : since October 1, we are open until 8:30pm on friday and saturday. Hoping to welcome you at Legrand again ! ... in traditionellen Lokalen zu atmen, beispielsweise zu Mittag in einem Bistro wie dem winzigen »Comptoir du Relais« des Starkochs Yves Camdeborde, in dem sich Essbegeisterte aus aller Welt um die wenigen Tische reißen. ... Auf dem Weg dahin empfiehlt sich ein Abstecher auf ein Gläschen in die stimmige Weinbar »Au Sauvignon«. ­Danach geht es zurück nach Montparnasse, um zum Abendessen ­das einzigartige Ambiente einer echten ­Brasserie zu genießen, wie zum ­Beispiel in der »La Coupole« mit ihren Hunderten ­Sitz­plätzen und unzähligen Kellnern, ­deren ­perfekt eingespieltes Servier-Ballett ­allein schon einen Besuch wert ist. ... auf die kleinere und verschlafen wirkende Ile Saint-Louis, wo im »Le Sergent Recruteur«, einem der angesagtesten Restaurants der Stadt, ein leichtes und kreatives Mittagsmenü wartet. Etwas versteckt in einer Ecke des Platzes ­befindet sich das Drei-Sterne-Restaurant »L’Ambroisie«, das zu den klassischen Tempeln der Haute Cuisine zählt, und in dem Bernard Pacaud und sein Sohn Mathieu für den kulinarischen Höhepunkt eines Paris-Aufenthalts sorgen. Oder das »Septime«, das Stammhaus von Bertrand Grébaut, der wenige Meter weiter auch das Fischrestaurant »Clamato« sowie die Weinbar »Septime La Cave« betreibt. Place des Victoires, wo sich Designer niedergelassen haben und mehrere Lokale angesiedelt sind, die in die Kategorie Bistronomie fallen, also gehobene Küche im einfachen Rahmen bieten, wie etwa das »Saturne«, das »Frenchie« oder das »yam’Tcha«, die zudem alle gemein haben, dass man lange im Voraus reservieren muss. Wer es klassischer mag, kann eine Runde durch die prachtvollen Gärten des Palais Royal spazieren. Zu Zeiten der Französischen Revolution eröffneten hier die weltweit ersten Lokale, die unter die Begriffsbezeichnung Restaurant fielen. Ein einziges von ihnen ist noch übrig: das äußerst elegante »Le Grand Véfour«, wo schon Napoleon Bonaparte seinen Stammtisch hatte – und das den Besucher durch seine Lage, durch sein gut erhaltenes Interieur und durch das seit zwei Jahrhunderten gleichbleibend hohe Niveau der Küche daran erinnert, dass Paris Ursprungsort aller gastronomischer Kultur und Hauptstadt des guten Essens ist. Le Timbre, 3 Rue Sainte-Beuve, 75006 Paris. Dirk Eisel Favorit. After what felt like ages, I visited my favourite restaurant in Paris, Le Timbre, again today. The restaurant is regularly awarded a Bib Gourmand in the Guide Michelin, which is more than deserved. And it was great - as usual. Chef Charles Danet’s dishes, which are prepared in a ridiculously small kitchen, get more and more refined each year. The wine list also contains some real treasures, and so I chose the 2014 "Les Gryphées Vieilles Vignes" Chardonnay from legendary Jura winemaker Jean-François Ganevat. Michelin-starred chef Bertrand Grébaut and Théo Pourriat's no-reservations seafood house is so new, the folks rushing past it to Septime, their hyped sister restaurant next door, have no idea it even exists—yet. The decor at Clamato is understated yet warm—wood-planked ceiling, brick bar with high stools, reclaimed-wood tables—while the sharing-plates menu, which changes daily, is modern and refined. Arrive early—sevenish—to get a seat, and order a rosemary gin and tonic or a glass of Cornelissen rosé to accompany your Maldon oysters, followed by smoked eel and lentils, or scallops dressed up with endive and orange. DON'T MISS: The octopus carpaccio with grapefruit pulp and anchovy.